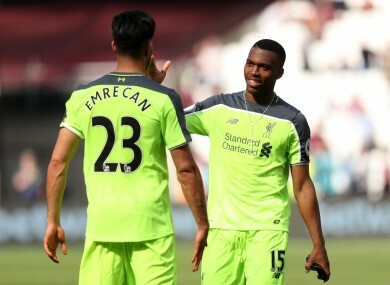 LIVERPOOL STRIKER DANIEL Sturridge insists he has no concerns over his future after helping Jurgen Klopp’s side consolidate their place in the Champions League qualification spots with a 4-0 win at West Ham. Making his first Premier League start since January, Sturridge opened the scoring 35 minutes into Sunday’s encounter at London Stadium, with a brace from Philippe Coutinho and a late effort from Divock Origi making sure of the points after the interval. Sturridge – a fringe player since Klopp’s arrival on Merseyside – has been linked with a move away from Anfield in the upcoming transfer window, but the England man was quick to dismiss the rumours. “I don’t have any worries about next season,” Sturridge told Sky Sports. Sturridge displayed the clinical edge the Reds have been lacking at times this term with his opener – a brilliant run and finish from Coutinho’s pinpoint pass. The 27-year-old has struggled for form and fitness this season and that was just his third league goal of the campaign, but Sturridge claims his sole focus is on helping Liverpool secure a top-four place. “It was an important game for us. We had the right attitude and we got an important victory,” he said. “I feel sharp. I’m glad to be starting and providing chances for the boys. “We could have scored the first goal with [Sam] Byram, we should have equalised and the third goal was a strange decision,” said the Hammers boss. The result leaves Bilic’s side 12th, having finished seventh last season. Email “Sturridge has no concerns over Liverpool future after goalscoring return”. Feedback on “Sturridge has no concerns over Liverpool future after goalscoring return”.